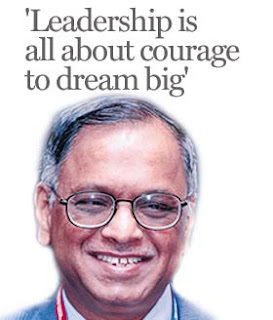 In this the concluding part of the interview, N R Narayana Murthy, co-founder and chief mentor of Infosys Technologies talks about the best business decision he ever made, the reason why the core Infosys team has been together for all these years, the Satyam fiasco, what money means to him and what aspiring entrepreneurs need to succeed. What would you say has been your best business decision? My best business decision is clearly sitting down with my younger colleagues and together coming to the conclusion that our objective must be to seek respect from every one of our stakeholders -- respect from customers, respect from employees, respect from vendor partners, respect from investors, respect from government of the land, and respect from society. . . I can tell you that that is the best decision that I have taken. We had a four-hour-long discussion in 1981. Somebody said we must be the company with the most revenue, somebody else said we must be the most profitable. Finally, we all agreed that we will become the most respected company in India. Our logic was very simple. If we seek respect from our customers, we will not shortchange them; if we seek respect from our employees, we will treat them with dignity and fairness; if we seek respect from our investors, we will follow the best principles of corporate governance; if we seek respect from our vendor partners we will be fair with them and sympathetic to them; if we seek respect from the government, we will not violate a single law of the land, and if we seek respect from our society, we will give back to the society. And then we said revenues will come, profits will come, market capitalization with come. 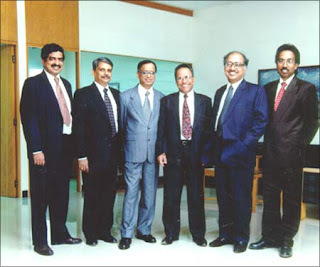 And in 1999, when Economic Times instituted their award, we were the first company to win the award of the Best Company of the Year, ahead of all multinationals and corporations much bigger than us! To me, that has given us the greatest satisfaction: the fact that we chose respect as the most important objective. And what has been your biggest achievement? In some sense, articulating the need for respect and convincing my colleagues to accept it. . . and then we said we will accept deferred gratification. We started with only Rs 10,000 as equity. We took very low salaries, we spent less than what we earned, we paid dividend, we paid tax and put money back into the business. . . our lifestyles were very, very simple. What has kept the core Infosys team together all these years? Clearly, the value system. We have always put the interest of the company ahead of our personal interest. Even today whenever there is a discussion, the moment a person is convinced that this decision is in the interest of the company and that there is no vested interest in the person that is propounding that idea, then everybody stands up and salutes and . . . we go ahead. . .
How do you resolve differences? 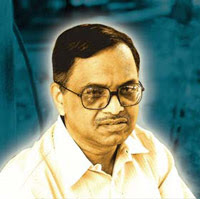 What do you think went wrong in the case of Satyam, and how did it affect you? I was disappointed, disgusted. The IT industry has done a pretty good job of raising the country's image in the world and Satyam has hurt it. Satyam is a classic example of a company with a feudal culture where there are different sets of rules for the king and the rest of the employees. There is opacity due to a centralised authority and in such an environment best practices are subordinated to quick profits. Opposition is impossible. In such a culture, the rest of the people are afraid to question the king even if they perceive something is going wrong. This is not a case of failure of entrepreneurship. . . It is a case of greed and ego of some super managers. That is not capitalism. Capitalism is all about creating an environment where individuals can leverage their innovation and entrepreneurial skill to create better opportunities. The real character of the person can be known only through what he does when nobody is watching. It is the value system that determines the core of an individual. What five things should young entrepreneurs do to succeed? 3. The market must be ready for your idea. If the market is not ready for your idea, doesn't matter how smart your idea is, you will not succeed. 4. You need a good value system, because entrepreneurship in the beginning is all about sacrifice, hard work, deferred gratification, disappointments. It is the value system that creates confidence in each member of the community that other members too are doing the same to make this company succeed. . .
5. You need funds. . . but that is easy, finance is not a problem. You know, the power of money is the power to able to give it way it. You definitely need a certain level of wealth to take care of your material needs, no doubt about it.. housing, health, basic necessities. But beyond that the power of money is to make a difference to those people whose need is much greater than yours, to whom the value is much higher than the value that you can assign to the money you have, or for whom the difference will be much higher than what it is for you. So essentially, the power of money is the power to give it away. 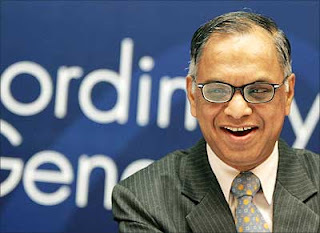 . .
Will your children join Infosys? 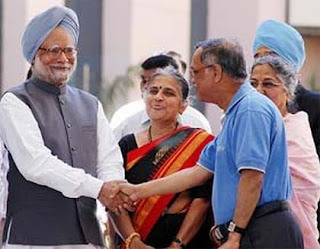 Is there a message you would like to give the Indian voters? I am a member of the advisory board of JaagoRe campaign which aims at getting a billion Indians to vote. It is by Janaagraha and Jasmine Shah is the coordinator. I do believe that it is very important for every adult Indian to exercise his or her franchise. In a democracy the most powerful instrument that any voter has is his or her vote and that opportunity comes only once in a while. . . so they have to make sure that they do this very diligently, very wisely and with utmost focus on merit so that the best candidate is sent to govern the nation.